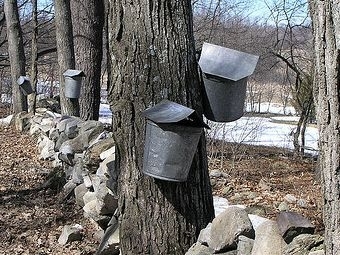 Vermont is known for its religious devotion to real maple syrup. On this week’s VPR Table, you can almost smell the boiling sap turn to syrup. We’ll explore the rural sugaring tradition in detail. Rowan Jacobsen shares his reverent perspective on maple syrup. Catch The VPR Table Friday afternoon at 5:55 and Saturday morning at 8:55 on VPR. Listen….Hear that?…it’s the sound of the North Woods’ great awakening. After five months of flatlining, the pulse has returned. All across Vermont, maple trees are stirring to life, and sugarmakers are stirring with them, preparing buckets, sap lines, and cords of wood for their arches. It’s the quintessential rite of spring, with all the trappings of any good ritual: Neighbors gathering in high-cupolaed sugarshacks to take a little communion in the form of pickles and syrup and watch steam rise from the altar of the evaporator, the sugarmaker presiding over all like a high priest.Most people in the North Country know that it takes 40 gallons of sap to make one precious gallon of syrup. And they know that it takes warm days and freezing nights to get the sap flowing, because the changes in pressure as the trees thaw and freeze literally pumps the sap up the trunks. Less well known is where that miraculous maple flavor comes from. It’s basically caramel. When sugar is cooked down into a brown, bubbling syrup, the intense heat forces the sugar molecules to combine with other molecules. The result is that you create some of the same flavor compounds found in butter, fruit, nuts, and flowers. That’s pretty much the flavor you get in Fancy syrup, the first of the year. As the year progresses, however, the syrup gets darker and stronger flavored. The essence of maple emerges, with hints of coffee, chocolate, smoke, and bacon, as well as a much richer caramel flavor. For that, we can thank bacteria, which live in maple sap and eat sugar. To accomplish this, they have to break it down in a way that enhances caramelization. The bacteria themselves also create new flavors as they are boiled in the sap—that’s where a lot of the smoky, nutty aromas come from. Late in the season, the bacteria can get too strong, and the syrup can taste bitter, burnt, oniony. But until that point, bacteria are key players in good syrup. So the next time you step into a sugarshack for a little spring communion, be sure to give thanks for these microscopic sugarmaker’s apprentices. Weekend March 19 and 20. A maple specialist for the Vermont Department of Agriculture shares his thoughts on what distinguishes one jar of maple syrup from another.